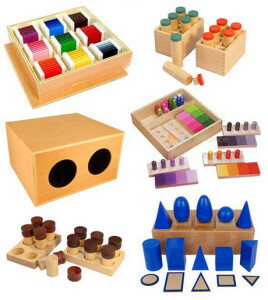 As the child’s exploration continues, the materials interrelate and build upon each other. For example, various relationships can be explored between the pink tower and the broad stair, which are based on matching precise dimensions. Later, in the elementary years, new aspects of some of the materials unfold. When studying volume, for instance, the child may return to the pink tower and discover that its cubes progress incrementally from one cubic centimeter to one cubic decimeter.